Hotel 939 Rome - Location & Things to See in Rome - In the perfect location to explore Rome’s most ancient and breathtaking sites! The Hotel 939 Rome is located in the heart of the magical city of Rome, making it accessible to all of Rome’s most breathtaking sites and historic monuments. Within a short walking distance from this central Rome 2 star hotel visitors will arrive at the very popular Spanish Steps, which can be followed by a stroll down the picturesque street of Via Condotti, filled with well known designer shops and high fashion boutiques. Surrounding this high quality yet cheap hotel in Rome are beautiful buildings of Baroque architecture and narrow streets filled with delightful cafes, markets and delicious restaurants. 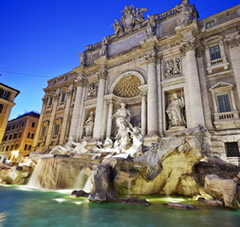 From the charming Hotel 939 Rome guests can walk along the ancient cobblestone streets, quickly arriving at Rome’s most popular sites and attractions, including the famous Trevi Fountain, where visitors can partake in the traditional coin throwing, which is said to ensure a return to Rome. Please print out the map above to assist you. 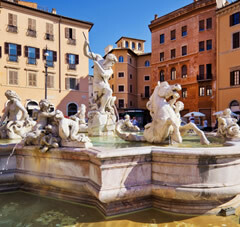 Piazza Navona, a short walking distance from this 2 star Rome accommodation, is a spectacular square containing 3 beautiful Baroque fountains with amazing sculptures. Nearby Piazza Navona is the historical Pantheon, originally built as a temple to the Roman gods and later donated to the Christian Church by the Emperor Phocas. Buried at the Pantheon are two of Italy’s important kings, Vittorio Emanuele II and Umberto I. The Hotel 939 Rome can be easily reached from both of Rome’s international airports Fiumicino Airport and Ciampino Airport. Every 30 minutes the Leonardo Express transports passengers to and from Fiumicino Airport to Termini Station, Rome’s central train station and hub of Roman public transportation including buses and both metro lines. 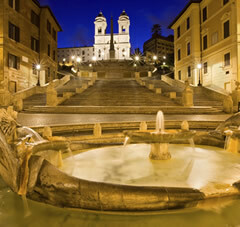 From Termini visitors can take Metro A to Spagna or ATAC bus number 492 to reach the Hotel 939 Rome. A taxi is not recommended during the hours of public transport, as the metro system is extremely easy to navigate and considerably easier on the wallet!